Hortus Camdenensis | Ixia maculata L.
Cormous perennial with lance-shaped, usually twisted, leaves and spikes of few to many orange or yellow flowers with dark purple or black centres, in spring or early summer. To 50cm. [RHSE, Hortus, CECB]. A polymorphic species ‘of outstanding beauty’. [Grey]. 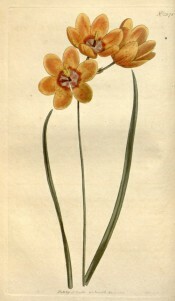 Although long cultivated in Britain, according to Miller, it was rare by 1800. [ABR pl.196/1801]. The variety minor flore purpureo is figured in ABR pl.256/1802 and viridi nigra, green flowers with a dark centre, is figured as Ixia spicata var. viridi nigra in ABR pl.29/1798. Introduced to Britain in 1780. [JD]. The plant figured at BM t.1378/1811 as Ixia monodelpha is probably a form of Ixia maculata. Listed in all published catalogues [B.281/1843]. Ixia maculata was received per ‘Sovereign’ February 1831. [MP A2948]. See also Ixia maculata L. var, fuscocitrina, Ixia maculata L. var. flavo-aurea, Ixia maculata L. var. columellaris and Ixia maculata L. var. conica.